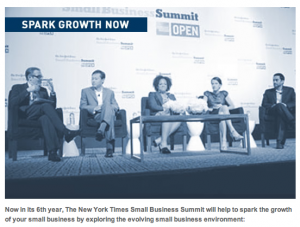 In its 6th year, the New York Times Small Business Summit – sponsored by American Express – will be held at the Grand Hyatt Hotel in New York City on June 13th. While most of our readers won’t be able to fly to NYC, the admission fee for those close to Manhattan is a very reasonable $99, and anyone that wants to can register for the small business conference here. While I don’t doubt that there will be plenty of networking opportunities for small business owners, having the CEOs of large tech companies like the Gilt Group and Living Social don’t really strike me as small business “counterparts,” but possibly a chance to pitch your small business partnership idea with such companies? Check out their speaker lineup this year.